LSF Skydivers check it off the bucket list! Invite Your Friends and Co-workers to an LSF Happy Hour! Start Lowering your Dues Today! LSF Celebrates Corporate Partners KPMG, Cramer-Krasselt, and eShots – July Appreciation Month! Through the whole month of June, show your KPMG, Cramer-Krasselt, or eShots Employee ID badge at Lakeshore Sport & Fitness – Illinois Center and take advantage of our AON Appreciation promotion. We’re glad you’re our neighbor, and we want to thank you for stopping in! In addition to receiving 20% OFF services at the Spa@IC or 10% OFF onsite chair massage for your department, Press Kitchen will serve daily specials, each week, all month long! Rooftop Beer Yoga on July 18th – Beginners and all levels welcome! Let LSF help you get over the mid-week hump as you take in views of the city and a beer with Rooftop Beer Yoga! New to yoga? This is an easy and fun way to introduce yourself – unwind and escape with other LSF members and guests as you experience an instructional yoga class for all levels. First timers and experienced yogis welcome! One beer or glass of wine included with class ticket purchase – additional beer & wine pours available for $5! Must be 21+ and present a valid ID. Congratulations to our LSF Members & Guests that built up the courage to “jump out of a perfectly good airplane!” LSF@IC hosted this adventurous group at the Chicagoland Skydiving Center for a day full of fun and thrills! What’s our next adventure? Follow us on Facebook or contact ICEvents@LakeshoreSF.com and stay tuned to find out! Press Kitchen Item Highlight: Add a little spice to your routine with the Al Pastor Bowl! Did you know that Press Kitchen offers several Signature Bowls in addition to a “Build Your Bowl” option? 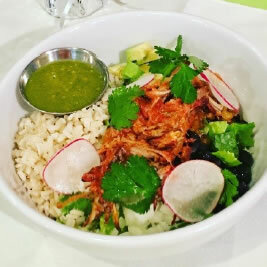 Among these is the incredible Al Pastor Bowl that will add a little kick to your day with its amazingly delicious combination of grilled pineapple, brown rice, black beans, onion, romaine, avocado, cilantro, and spicy salsa verde! Available at Press Kitchen for $9 – come by and enjoy! Member Success Story – Meet Michele Morris! Michele Morris works with Senior Trainer Katie Nash. She started out doing limited pool workouts twice per week while seeing a physical therapist. After graduating from physical therapy she started doing strength workouts and it was as if she never had any limitations. 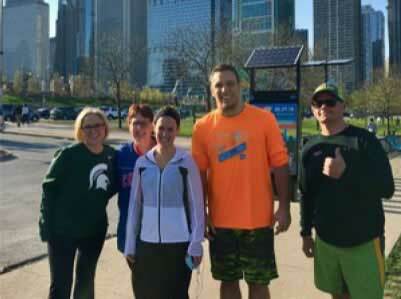 Join the LSF Running & Walking Club! All fitness levels are welcome! 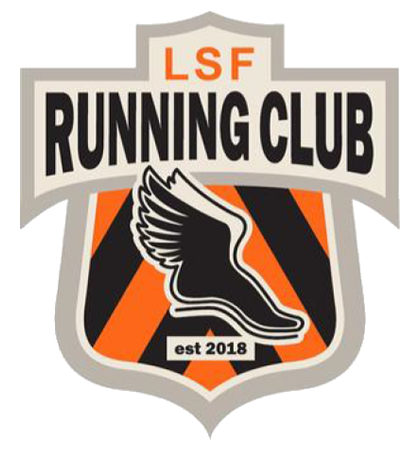 The LSF Running Club is a social community of active lifestyle enthusiasts committed to being active together. Remaining active is at the core of what we do, and we welcome athletes of every type from walkers to veteran marathoners.Get access to four group sessions a week for a onetime registration fee of $35 for the season. After that, let the incentives roll in based on your attendance at the group sessions – anything from Complimentary Smoothies from Press Kitchen to 50% OFF massage at the Spa@IC! Interested? Register now or get more details by contacting our Social Programming Director, Luis Davila, at ICEvents@LakeshoreSF.com. Looking for a fun way to escape the craziness of the week and enjoy social time with friends and co-workers? Let the good times roll and book an LSF Happy Hour including stationed appetizers and 2-Hours of Open Bar Beer/Wine for $25/person (15 person minimum). Semiprivate space and upgrades available. Some restrictions apply. 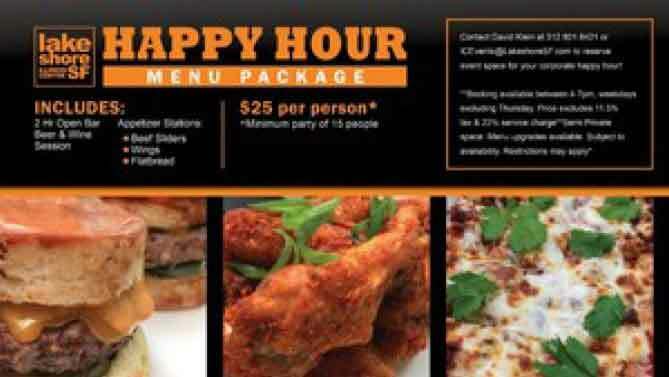 Contact David Klein at ICEvents@LakeshoreSF.com or 312-801-8421 to reserve event space for your corporate happy hour! Conference Room Chair Massage by the Spa@IC! Provide your employees and co-workers a break and let them relax at the hands of our Certified Massage Therapists form LSF and the Spa@IC. The value of a chair massage from the Spa@IC is unbeatable! Whether the massages are paid for by your corporate wellness program or by the employees themselves, anyone who takes advantage will get a 25% discount on their next Sport or Relaxation table massage within 30 days at the Spa@IC. For more information or to book your conference room chair massage now, contact ICSpa@LakeshoreSF.com. Want to participate in the Chicago Triathlon on August 25th & 26th? Want to make a bigger impact by racing and training with a charity team? 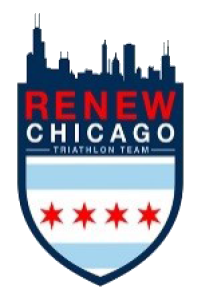 The Renew Chicago Triathlon Team has extended $10 OFF registration with discount code, Lakeshore18. There is not a minimum fundraising requirement, but 100% of any money raised will directly impact local Chicago charity partners: Brave Initiatives, Safe Families for Children, and Breakthrough Urban Ministries! To register, learn more, or donate now, please email our Social Programming Director, Luis Davila, at LuisD@LakeshoreSF.com or visit RenewChicago.DonorDrive.com. Rachel is one of our Senior Tier Trainers and Swim Coach. She has swam competitively since she was 8 years old. In high school she started teaching swim lessons to all ages. Rachel progressed to coaching age group swim teams then masters adult swim teams on a larger scale. She spent over three years learning the total immersion program and how to coach triathletes for pool and open water. She’s always loved teaching all ages from toddler to adults who need to learn how to swim or improve their technique for fitness or fun. To book with Rachel, email ICPT360@LakeshoreSF.com. Referrals are the cornerstone of Lakeshore Sport & Fitness. Your referrals are both welcome and rewarded with $10 off your monthly dues, every month, per referral, for as long as they’re active members! The more friends you refer the more opportunities you have to lower your dues. Contact your Account Manager for guest passes. If you are interested in booking your own private event on the LSF-IC Rooftop, please contact ICEvents@LakeshoreSF.com.